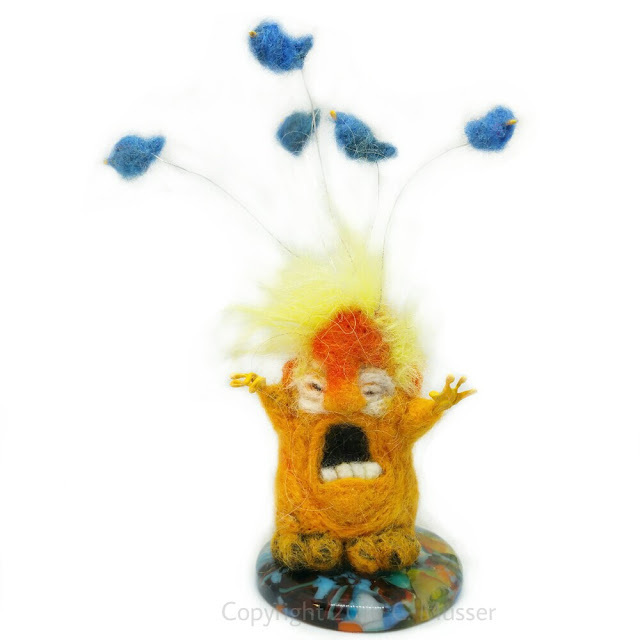 New artwork: Needle Felted Wool Sculpture, Volcano Troll! One of my recent pieces in mixed media now up for auction on Ebay. 50% of the proceeds will be donated to the Sierra Club. Volcano Troll! 2016, wool/mixed media. The perfect gift for the hotheaded executive in your life. Volcano Troll! This little troll of fury measures approximately 1x3.5" (troll head to toes) and has the temperament to erupt at the smallest slight. A functional piece that can be used as a pin cushion, memo holder (for those 3 a.m. thoughts best not released to the world on social media), and paperweight (to contain pesky papers such as conflicts of interest, resumes of qualified individuals, and intelligence briefings).